Today's Look: creates bold contrast using the most famous opposites, black and white. It was a chilly, overcast day, so I first chose a peacoat with white and gold detailing. The coat is soft and cozy, along with being flattering and feminine. Next, I chose black jeggings, black socks, and black ankle boots featuring a buckle embellishment. To accessorize, I chose white/gold bracelet, gold bedazzled watch, gold hoop earrings, black/gold funky sunglasses (cat-eye frame with gold rimmed circular lenses), and two rings. Last but not least, I wore an oversized, black purse to match the boots and complete the look. Outfit Details: Coat c/o Charlotte Russe ❤, Jeggings by Hue at Dillard's (Prescott, Arizona), Boots by Steve Madden from 6pm.com, Purse from Sage Brush Trading Co. (Flagstaff, Arizona), Sunglasses from Black Hound Gallerie (Flagstaff, Arizona), Earrings at Macy's (San Antonio, Texas), Bracelet from Charlotte Russe (Scottsdale, Arizona), Watch from Charming Charlie (Tucson, Arizona), Rings from Premiere Designs. Fashion Tip: Peacoats are great for the fall and winter seasons. The styles and colors can range from looking hipster to chic. A white peacoat is always classy and stands out. 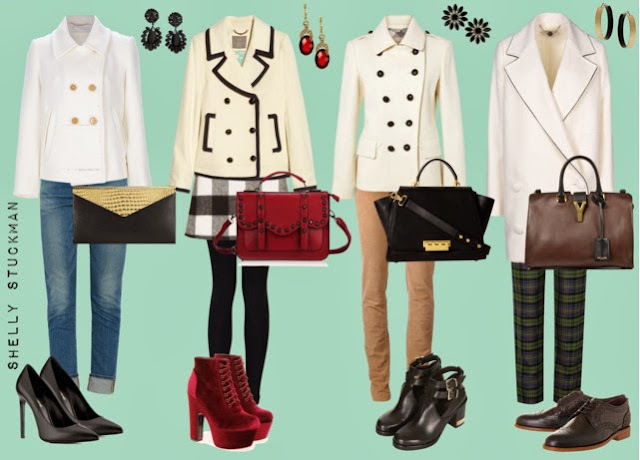 More ways to rock white peacoats and outfit links found here.